Rabbi of Berlin; died March, 1728. After filling the office of rabbi in several Polish communities he removed about 1701 to Berlin, where, with his brother-in-law Aaron, he was entrusted with the direction of the yeshibah founded by Jost Liebman. When in 1713 Aaron was called to the rabbinate of Frankfort-on-the-Oder, Jehiel was nominated rabbi of Berlin.This nomination was ratified by royal edict in 1714, which provided that when the rabbinate of Frankfort became vacant it would be annexed to that of Berlin. Accordingly on the death of Aaron in 1721 Jehiel's jurisdiction was extended to Frankfort. 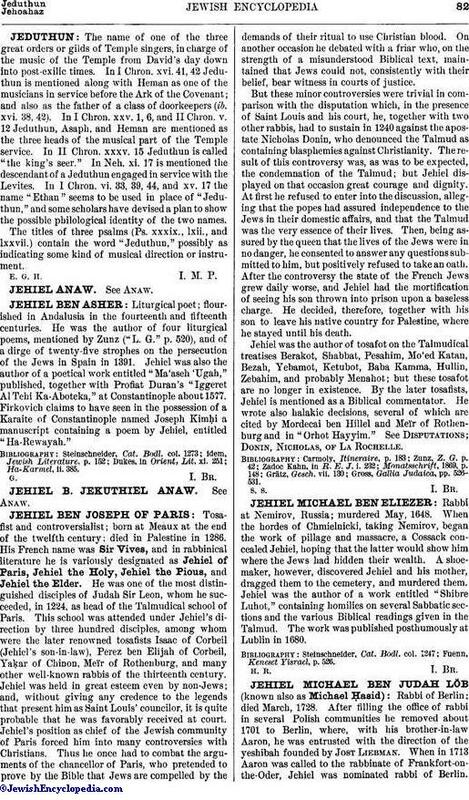 Jehiel was a Talmudist of high repute, and was well versed in Cabala. His predilection for Cabala was, indeed, so great that he blindly gave his approbation to the works of the Shabbethaian Ḥayyun. Jehiel, however, was not long in acknowledging his fault, and at the conference of rabbis held at Frankfort-on-the-Oder in 1726 he was the first to demand that a "ḥerem" should be launched against the followers of Shabbethai Ẓebi, and that all the cabalistic works published since 1666 in which Shabbethaian ideas were expressed should be put under the ban. Jehiel's distrust of the Cabala became, indeed, so great that he abstained from publishing his own cabalistic works, fearing lest they might be interpreted in the Shabbethaian spirit. Jehiel wrote novellæ on Megillah (published with the text at Berlin in 1714) and on Rosh ha-Shanah (published in the 1726 Amsterdam edition of the Talmud). Other novellæ and homilies of his are scattered in various works of his contemporaries, such as the "Ḳol Yehudah" of Judah Glogau, the "Asifat Ḥakamim" of Israel Isserles, etc. 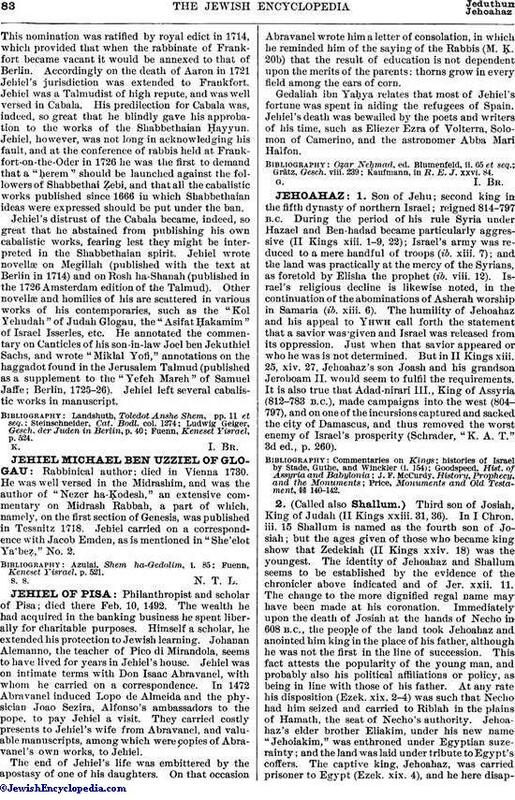 He annotated the commentary on Canticles of his son-in-law Joel ben Jekuthiel Sachs, and wrote "Miklal Yofi," annotations on the haggadot found in the Jerusalem Talmud (published as a supplement to the "Yefeh Mareh" of Samuel Jaffe; Berlin, 1725-26). Jehiel left several cabalistic works in manuscript. Fuenn, Keneset Yisrael, p. 524.